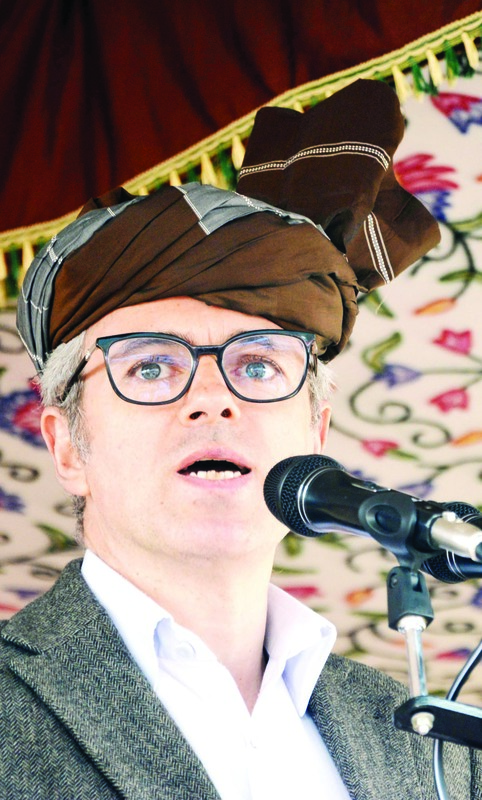 SRINAGAR, Apr 14: Claiming that Jammu and Kashmir's special status was in peril, NC vice-president Omar Abdullah Saturday hit out at the BJP alleging that its "explicit and forceful undertaking" to revoke the constitutional safeguards of the state by 2020 reveal their "malicious agenda". Addressing an election rally in Dak Bungalow area of Anantnag, the National Conference leader alleged that the previous PDP-BJP government had thrown the state into chaos. "We have seen how explicitly some of the high-flying ministers of the Union Cabinet have come out against the special status of our state. The recent uncouth and spiteful statements of ArunJaitley and Amit Shah are a case in point. Our concern is legitimate in view of the BJP's undertaking in their manifesto about doing away with the special position of our state," he said. Abdullah said amidst these "intimidations", it becomes imperative for the people of the state to be united to save the constitutional safeguards of the state. "The opportunity is tapping our door. We should not let it pass. We should avail this opportunity and cleanse the state and the country of communal yolk," the former chief minister of the state said. "Today, our religious leaders are being intimidated, thousands of our youth are behind the bars. Who is responsible for this? I was not in power when cases were stashed on Mirwaiz Umar Farooq by the NIA, it was during Mehboobaji's tenure that cases were filed against Mirwaiz. She cannot absolve herself of the role she played in destroying the state," he said. Abdullah claimed that south Kashmir bore much of the brunt of the PDP-BJP "hobnobbing". "However, I assure you that once the NC comes to power, all pending cases against our youth will be reviewed. We will make amends to the wrongs committed by the PDP. I reaffirm that once in power, PSA has to go lock, stock and barrel," he said. Hitting out at PDP leader Mehbooba Mufti, Abdullah said, "She should come before people and reveal what points she was able to achieve from the much touted agenda of alliance (PDP-BJP common minimum programme). Let the people know, people are seeking answers from her," Abdullah said. Referring to the party's candidate from Anantnag Parliamentary constituency Justice HasnainMasoodi (retd), the NC leader said, "He bears the indispensable political and legal acumen to fight for interests of our state inside parliament."